The Mitos Sensor Display can be used interchangeably with the Mitos Flow Rate Sensors (Part Nos. 3200096-3200100) which simply attach with a push-click action. Easy to use, the Mitos Sensor Display provides a USB connection and visual output for displaying micro-scale flow rate and pressure. Please note that the Mitos Sensor Display requires at least one pressure sensor or flow rate sensor. Please check you have all the parts required for your system. 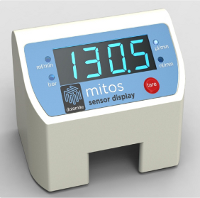 The Mitos Sensor Interface provides a cost-effective alternative to the Mitos Sensor Display featuring a circular multi-pin interface cable for connection to the Mitos P-Pump range allowing flow rate data to be read by the Mitos P-Pump software. Designed for use with the Mitos Sensor Display (Part No. 3200095), the Mitos Flow Rate Sensors enable fast and accurate measurements of ultra low liquid rates. The high precision thermal sensor technology provides total media isolation and extremely low internal volume with no moving parts. All measurement data is fully calibrated for water and temperature compensated by means of an internal microcontroller.